Since the age of 18, Mr. Behr has been an active teacher and performer in the Milwaukee metropolitan area. He has been a faculty member of the Wisconsin Conservatory of Music since 2009. He earned his Masters Degree in classical guitar at UW-Milwaukee, studying with Professor Rene Izquierdo. In addition to teaching, Mr. Behr is a member of the Milwaukee Guitar Quartet and maintains an active performance schedule around Milwaukee and abroad. In 2008, Mr. Behr was asked by composer Carlos Rivera to record Cancion, his acclaimed solo work for classical guitar. In 2009, composer and guitarist Štepán Rak requested Mr. Behr to perform the American premiere of his new work titled Royal Suite. Mr. Behr was a recipient of the “Dr. Shinichi Suzuki” scholar award in 2010 & 2011. René Izquierdo graduated from the Amadeo Roldan Conservatory and Superior Institute of Art in Havana, where he studied with renowned guitarist Jesus Ortega. After his arrival in the United States, he graduated from Yale University School of Music, where he studied with Benjamin Verdery. At Yale, he earned a Master of Music and an Artist Diploma degree and was awarded the Eliot Fisk Prize to an outstanding guitarist. He has studied with Leo Brouwer, David Russell, Shin-Ichi Fukuda, Eli Kastner, Pepe Romero, Angel Romero, Carlos Barbosa-Lima, David Starobin, Eduardo Fernandez, Jorge Morel, Robert Beaser and Anthony Newman. Mr. Izquierdo is currently recording his debut CD with Luthier Music Corporation. Izquierdo has been awarded several competition prizes and most recently was a finalist in the JoAnne Falletta International Guitar Concerto Competition. He has appeared as a guest soloist and in chamber music concerts throughout the United States, Canada, Cuba, Spain, France and Italy. In 2004 he performed the Villa-Lobos concerto with the Buffalo Philharmonic Orchestra and played the U.S. premiere of The Divan of Moses Ibn-Ezra by Castelnuovo-Tedesco, a 19-song cycle, with soprano Arianne Slack in a Merkin Archive concert. Tom Strini started writing about the arts in Milwaukee in 1982, when he joined the Milwaukee Journal as dance critic and critic at large. His title changed to music and dance critic in 1987, a role he held at the paper through and beyond the 1995 merger with the Milwaukee Sentinel. Strini has substantial teaching experience. He developed and taught two courses in the Honors College at the University of Wisconsin-Milwaukee: "Seeing, Hearing, Writing" and "American Songbook 1920-1960" and has led many writing workshops as a guest lecturer at UWM. Strini, a native of St. Louis, switched majors between music and theater a couple of times during his undergraduate studies. He finally settled on music and completed a bachelor's in theory and composition at Southern Illinois University-Edwardsville in 1973 and an MM in classical guitar at SIU-Carbondale in 1975. He studied music further at the University of California-San Diego from 1977-1979, where he also taught in the Warren College Writing Program. Anne Waller has performed as both a soloist and as a member of Waller and Maxwell Guitar Duo in concerts and festivals throughout the United States and Europe. She has also been heard on live broadcasts on radio and television as well as in master classes with Andrés Segovia, Oscar Ghiglia, and José Tomás. Other activities include conducting master classes at universities and festivals throughout the United States. Waller has studied with Robert Guthrie and Oscar Ghiglia. Nathan Wysock received Doctor of Musical Arts (with a major in guitar performance and a minor in early music) and Master of Music degrees from the Eastman School of Music. He earned a Bachelor of Music degree from Illinois State University. His teachers include Douglass Rubio, Angelo Favis and Nicholas Goluses. Dr. Wysock is an avid performer of both solo and ensemble repertoire and has performed in competitions in the United States and abroad. He has been a featured performer on Wisconsin Public Radio and has performed with the Lawrence Chamber Players, the Festival City Orchestra, the Edgewood Community Orchestra, the Lawrence Wind Ensemble, and L’Ensemble Portique. Recently he performed in a production of Henze’s El Cimmaron with Skylight Music Theatre (Milwaukee, WI). In his solo recitals Dr. Wysock creates innovative programs that range from ragtime to music of the Middle East. He has presented lecture recitals and workshops on tango, blues and 19th century music.Dr. Wysock is a dedicated teacher who has been on the faculty of several community programs, the secondary guitar program at the Eastman School of music and the Wisconsin Conservatory of Music. He is currently on the faculty at Lawrence University in Appleton and Edgewood College in Madison. As a member of Punch Brothers since the band's inception, guitarist Chris Eldridge has been at the vanguard of acoustic music for much of the past decade. Although initially drawn to the electric guitar, by his mid-teens Chris Eldridge had developed a deep love for acoustic music, thanks in part to his father, a banjo player and founding member of the seminal bluegrass group The Seldom Scene. Eldridge later gained in-depth exposure to a variety of different musical styles while studying at Oberlin Conservatory, where he earned a degree in music performance in 2004. During his time at Oberlin, Eldridge studied with legendary guitarist Tony Rice. After graduating he joined the Seldom Scene with whom he received a Grammy nomination in 2007. In 2005 he founded the critically acclaimed bluegrass band The Infamous Stringdusters. At the 2007 International Bluegrass Music Association awards Eldridge and his Stringdusters bandmates won Emerging artist of the Year, Song of the Year, and Album of the Year for their debut album, Fork in the Road. Meanwhile, in 2005 he had caught the attention of mandolinist Chris Thile, who enlisted him, along with banjoist Noam Pikelny, violinist Gabe Witcher, and bassist Greg Garrison to start working on an ambitious side project. Soon after they decided to focus all of their collective energies into band and Punch Brothers was born. The band has since released 4 critically acclaimed albums, received 5 Grammy nominations and toured around the world. Eldridge also plays in a duo with guitarist Julian Lage. Chris Eldridge has worked with a diverse cast of musical luminaries including Paul Simon, Renée Fleming, John Paul Jones, Julian Lage, Marcus Mumford, Justin Timberlake, T-Bone Burnett, Jon Brion, Fiona Apple, Elvis Costello, Jerry Douglas, Sara Watkins, Del McCoury and others. As a pre-teen, after a short stint in the air band Van Zeplica, Kurt Plahna realized it was time to learn real guitar. A self-taught rocker from the start, he eventually entered the guitar consortium program at UW-Milwaukee and the Wisconsin Conservatory of Music, earning a BFA with honors in 2000. Solo acoustic fingerstyle guitar became his favorite musical medium, though he continued to play, record, and experiment with various electric bands and groups around the Milwaukee area. Kurt went on to work full-time for Hal Leonard Corporation as an instructional guitar publication editor in 2003, managing the creation and production of guitar, ukulele, banjo, mandolin, harmonica, drum, brass/woodwind, vocal, and keyboard products (not to mention sitar, oud, and bagpipes!). He was also a contributing editor and columnist for Guitar Edge magazine from 2006 to 2010, and served as music director on a variety of instructional DVDs and web lessons for www.guitarinstructor.com. Kurt currently resides in the Milwaukee area with his wife and two daughters and continues to write and record music in his home studio. Visit Kurt’s music page at www.soundcloud.com/gratton. Matthew Schroeder is a Milwaukee based WAMI (Wisconsin Area Music Industry) winning guitarist who is equally at home on electric or acoustic guitar. Matt is one of a handful of players to graduate, with honors, from the short lived cooperative program between The Wisconsin Conservatory of Music and The University of Wisconsin-Milwaukee with a performance degree in American Finger-Style guitar. Matt is one of Milwaukee’s prominent guitar educators and serves as Chair of the guitar department at The Wisconsin Conservatory of Music, where he has taught since 1992. Matt is also the Artistic Director for the Wisconsin Conservatory of Music's annual Guitar Weekend Workshop and Interlochen College of Creative Arts' Fingerstyle Guitar Workshop. Matt is featured on recordings such as Pet Engine's 1994 release Hearts and Bones and Voices, the compilation CD American Finger-Style Guitar circa 1999, and his debut solo acoustic fingerstyle CD, Signal, which was released in 2006. Matt can be seen performing as a soloist, in a duo with vocalist Lynda Lee, with the all-star band Slumpbuster featuring KB from 96.5 WKLH-Milwaukee, and as the smoking guitar wielding "Space Ace" with the KISS tribute band Dr. Love. John Stropes is a leading authority on finger-style guitar. Through the historical research, analysis, transcription, teaching and performance of finger-style guitar, he has brought focus to this style as a significant American music. His publishing company, Stropes Editions, Ltd., has set a new standard for written music for the guitar and guitar education. Stropes was president of the Milwaukee Classical Guitar Society, 1985-1996 and artistic director of the American Finger-Style Guitar Festivals, 1985, 1987 and 1989, which were funded in part by grants from the National Endowment for the Arts. He performed and taught at the First Chinese Guitar Artistic Festival in the People's Republic of China in 1986 and returned to China in 1988 and 1990 to perform and teach with a performance at Beijing's Symphony Hall broadcast on Chinese television. He was advisor to the Beijing Guitar Research Association. chair of the Guitar Department, Wisconsin Conservatory of Music, 1984-1994, author of Michael Hedges/Rhythm, Sonority, Silence; Leo Kottke/Eight Songs; 20th Century Masters of Finger-Style Guitar and John Fahey's Guitar Christmas Book. Stropes is author of numerous transcriptions of contemporary works for finger-style guitar and related instructional materials and a frequent contributor to guitar publications. Jazz guitarist Julian Lage is somewhat of a child prodigy -- playing his instrument at the age of five and performing in public a year later. Shortly thereafter, Lage began playing with such renowned artists as Carlos Santana (when he was only eight years old! ), Pat Metheny, Kenny Werner, Toots Thielemans, Martin Taylor, and David Grisman, among others, resulting in Lage being the subject of the 1997 Academy Award-nominated documentary film Jules at Eight. In addition to performing, Lage has recorded as a duo with Grisman (the 1999 release Dawg Duos), and contributed a fine cover of "In a Sentimental Mood" with Martin Taylor and David Grisman, to the 2000 compilation Acoustic Disc: 100% Handmade Music, Vol. 5. In 2009, Lage released his debut solo album, Sounding Point, on Emarcy. The album was widely celebrated as the arrival of a new and authoritative voice on the instrument. This was followed by the concept album Gladwell in 2011. He fronted a quintet that featured bassist Jorge Roeder, tenor saxophonist Dan Blake, cellist Aristides Rivas, and drummer/percussionist Tupac Mantilla. The guitarist switched labels for 2013's Free Flying. Issued on Palmetto Records, it was recorded in duet with pianist Fred Hersch. Steve Lewandowski has more than 40 years of professional experience in the music business as a guitarist. His playing is characterized by widely diverse styles such as post-bop, funk edged jazz, and blues. He has arranged, composed, and conducted in a variety of popular and jazz bands, and played guitar as a theater musician, solo, on radio, recordings, and television. Steve has performed with a variety of international and local artists – The Milwaukee Symphony, Tha Racine Symphony, Gary Burton, Ashley Alexander, Alan Vache, Charlie Braughm, Russ Phillips, Bobby Lewis, Manty Ellis, Berkley Fudge, Fifth Dimension, Chuck Hedges, OPUS, Bel Canto Chorus, with touring Broadway shows such as Sweet Charity, Chicago, Lion King, Spamalot, Legally Blonde, and others. He has a rich history of club performances, shows, concerts, and clinics. As a member of OPUS he participated in the Vibrations Unlimited Series concerts with the Milwaukee Symphony, performed at numerous Summerfest, Lakefront Festival of the Arts and other music festivals, and backed artists such as Buddy Rich, Pat Metheny, Yellow Jackets, and Dizzy Gillespie. His original compositions from the EP “First Light” received airplay on public radio stations internationally. Steve was awarded “Best Guitarist, 2006”, and nominated “Best Guitarist, 2007” by the Wisconsin Area Music Industry (WAMI). More recently he has recorded a solo CD, “Familiar Melodies” which has received international radio attention, and has taken over leadership of Chuck Hedges’ Milwaukee Connection. In the summer, 2013, Steve premiered “Trinity” for jazz band and orchestra with the Racine Symphony Orchestra. A professional musician for 30 years, Don Linke is both a performer and educator. Linke has appeared in the pit at the Melody Top Theatre, Skylight Opera, Milwaukee Repertory Theatre, Florentine Opera and the Riverside Theatre. He has appeared as an opening act for Freddy Hubbard, Stanley Turrentine, and Richard Elliot; and on stage with jazz luminaries Greg Abate, Frank Morgan, Melvin Rhyne, Richie Cole and Brian Torfe. He has ten recordings including four critically acclaimed solo releases. He is the recipient of grants from the Wisconsin Arts Board and the United Performing Arts Fund. Linke began teaching at the Wisconsin Conservatory of Music in 1978 and has taught master classes and workshops throughout the country. His students are professional musicians around the world. As a professional musician for the past 30 years, and a broadcast editor for 12 years, Tanner-Monagle principal Bob Monagle brings a unique perspective to video editing. He combines unparalleled technical capabilities with a sensitivity to how the music, audio and photography come together to create arresting and effective visual communications. His national work on radio and television projects includes advertising spots, television shows, industrial, educational and corporate videos and interactive DVDs for clients such as Tenet Healthcare, Walgreens, Hal Leonard, Subway, Simplicity and Sun Country Airlines. His background in music and music composition, as well as video and audio production make him uniquely qualified to integrate the audio and visual elements necessary for achieving great work. He also directs and produces, and can assemble top-notch television and video production crews to see any project through from concept to completion. Paul Silbergliet is on faculty at the Wisconsin Conservatory of Music and a member of the Conservatory’s We Six jazz sextet. B.A., Oberlin College. An accomplished jazz composer as well as performer, Mr. Silbergleit has played clubs, concert halls, and festivals throughout the area as both a leader and a sideman. He has appeared with Jack McDuff, Jon Faddis, Richie Cole, Tierney Sutton, Melvin Rhyne, Brian Lynch, David Hazeltine, and the Milwaukee Symphony Orchestra, among others. Both his 1996 debut CD Silberglicity and his 2003 release My New Attitude have made it onto the jazz charts with nationwide airplay. He can also be heard on the 2005 We Six recording Bird Say. Mr. Silbergleit also teaches at Cardinal Stritch University, and is a featured instructor in Hal Leonard's Guitar Licks Goldmine DVD series. Celebrating over 30 years of musical accomplishments, virtuoso lead guitarist Daryl Stuermer of the super-group Genesis and Phil Collins has been touring the world to sold out crowds since 1978. Discovered while playing with his Milwaukee band, Sweetbottom, guitarist Daryl Stuermer made a fan out of Frank Zappa’s then-keyboardist, George Duke, who set up an audition for Stuermer to try out for acclaimed jazz violinist Jean-Luc Ponty. Stuermer burst into the international music scene, joining Ponty on an European tour and then recording on his four innovative albums. In late 1977, Stuermer was recommended as a replacement for longtime member Steve Hackett for the British progressive rock super-group Genesis, beginning his 30 year “permanent part-time stint” as lead guitarist with Genesis, touring the world to sold-out crowds and performing on seven Genesis albums. When Genesis drummer/singer Phil Collins launched a solo career during the early 80s, Stuermer became an integral member of the Collins’ solo band. Stuermer created the signature guitar sound of Collins’ solo mega hits “In the Air Tonight” and “Easy Lover,” and was co-writer of Collins’ 1989 GRAMMY® Award-winning and Billboard No. 4 single “Something Happened on the Way to Heaven.” Stuermer’s versatile jazz work can be heard on nearly all of Collin’s albums (all of which were major hits) including 1981’s Face Value, 1985’s No Jacket Required, 1990’s But Seriously and 1996’s Dance into the Light. In addition he’s performed on albums by Jean Luc Ponty, Frida Lyngstad (ABBA), Philip Bailey (Earth, Wind, & Fire), George Duke (Frank Zappa), and many others. Daryl has performed at the SuperBowl, Academy Awards, Oscars, MTV Awards, VH-1 Rock Awards and the “You’ll Be in My Heart” Tarzan World-Wide Premier Tour. Stuermer continues to expand on his accomplishments. In between the touring years, Stuermer launched his own independent record label, Urban Island Music, and continues to write music for his nine solo albums—Steppin’ Out, Live and Learn, Another Side of Genesis, Waiting in the Wings, Retrofit, The Nylon String Sampler, Rewired: the Electric Collection and Go! which showcases his acclaimed blend of rock and jazz guitar featuring original music, as well as unique Genesis renditions. After completing a successful tour opening for Mike + The Mechanics in early 2015, (Mike Rutherford, being Daryl’s tour mate with Genesis), Stuermer returns to the recording studio in Summer 2015 to create his newest CD, “Breaking Cover.” Stuermer’s highly anticipated CD will be his newest release in five years, and celebrates Stuermer’s personalized renditions of some of the biggest hit songs of the century while showcasing Stuermer’s award-winning guitar skills. Stuermer tours with the “Daryl Stuermer Band” performing in duo, quartet, five-piece and full symphonic shows throughout the world. 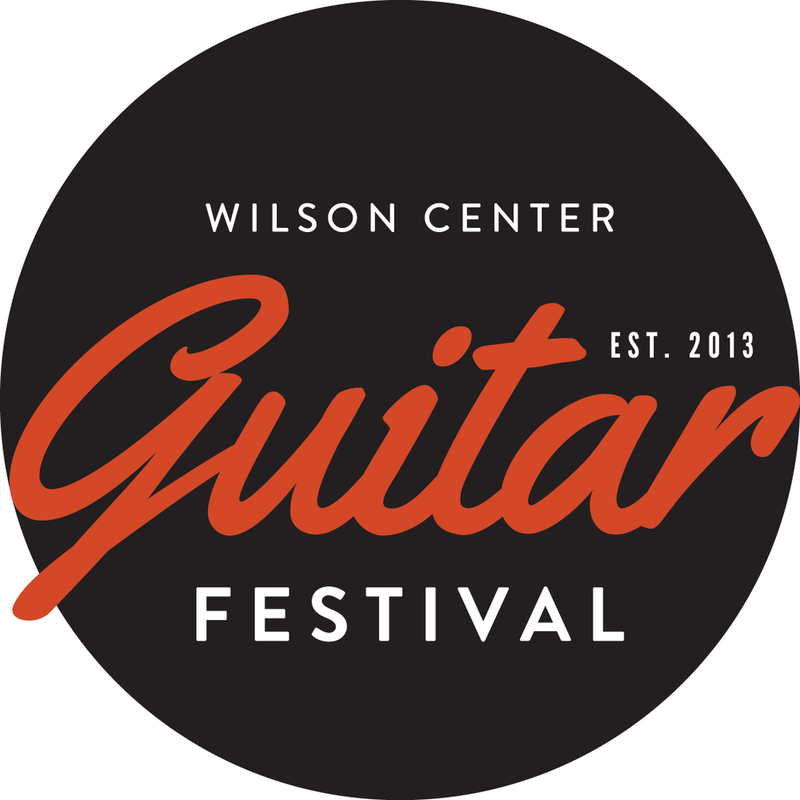 THANK YOU TO OUR 2013 WILSON CENTER GUITAR FESTIVAL SPONSORS!